UH Singers Head to Hungary! It’s a bit of an understatement to say that the University of Houston made a strong first impression at the Béla Bartók International Choir Competition. This year marked the first time the Concert Chorale was invited to the renowned competition, and the UH singers made it one to remember. 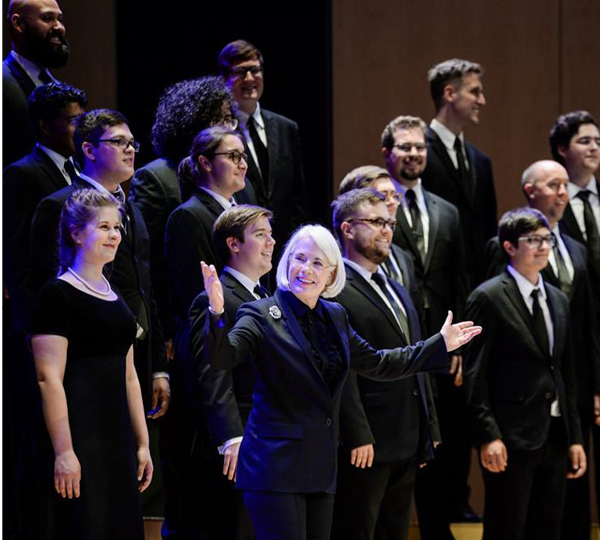 Cheered on by supporters near and far — including the dean of the Kathrine G. McGovern College of the Arts (KGMCA), Andrew Davis, who traveled to Hungary with the choir — the Concert Chorale sailed through the four-day competition. They tied for first place in the Mixed Choir division and placed second in the Chamber Choir division, before ultimately winning the Grand Prix award on July 8. The Concert Chorale performed 20 works at the competition, including three original compositions by UH composers. Graduate student Carlos Cordero, whose piece “This Sky” was among the three original UH works, described the experience as the highlight of his composing career. The performance crystalized everything Cordero loves about being a composer. “It was such a special moment to share the stage with my friends, who are such passionate artists. They are some of the finest artists I’ve worked with,” he says. Andrea Walker, the Moores School of Music alumna who served as student director during the competition, agrees. The 28th annual Béla Bartók International Choir Competition was held in Debrecen, Hungary from July 5 – 8. The Concert Chorale was announced the Grand Prix winner on Sunday, July 8.